Welcome to My Guitar Lessons website! This Play 10 songs with 2 chords video is now the most watched video on YouTube! It shows you the 2 easiest chords to play on guitar, and how to play the first of 10 songs you can play with just these 2 chords! The further 9 songs are shown in the video at the bottom of this page. Full tutorials for each of these songs are in separate videos, the links to those are also at the bottom of this page - just keep scrolling down! Each string is shown by a horizontal line. We number these strings 1 to 6 from the thinnest to the thickest. 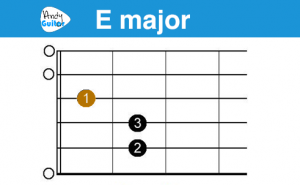 This is the E major chord. Each number tell you which finger to place down; 1 being index, 2 is middle and 3 is ring finger. 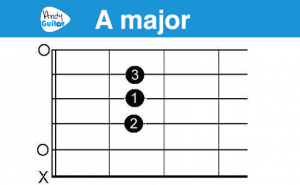 This is the 2nd chord we'll learn, the A major chord. Notice the 1st finger is on the same string as it is in the E major chord. If you're still really struggling after watching the video and using these notes above - no problem! Try this lesson from my full Beginners Guitar Course as a little pre workout, then come back to this when you're ready! The intro of the song we're going for uses something called 'Spreads', which is just one strum per chord on beat 1 of each bar. The verses and chorus use the same chord sequence but we strum on the beat, so 4 strums per chord repeated until the breaks post chorus. Song 1 - For What It's Worth by Buffalo Springfield - Song Tutorial & Play along! Many people have requested a video where I just go straight into teaching the song, so here it is! If you've successfully played along with Andy in the full demo video above, you can move straight on to Level 2 of this Beginner Guitar Course if you wish, where we'll be checking out a NEW chord and a higher level strumming pattern! Here's a quick demo of ALL 10 SONGS you can play with just the E major & A major chords! See a tutorial for each of these songs in separate dedicated videos here. If you need more help or want to make paster progress as a beginner, you may wish to checkout the more detailed lessons at Level 1 of Andy's complete Beginners Course, where the chords, changes, strumming etc are broken down into separate videos. Get these videos plus loads more content including practice routines and tips as part of Andy's FULL 63 video Beginners Course on streaming + download, DVD and physical paperback book!